Almere Stad is the commercial hub of Almere. 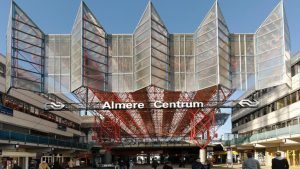 Almere Centrum Station is the name of both the main train station and the main bus station. Although Almere is much bigger, the map above will give you a quick guide to the Almere City Center. 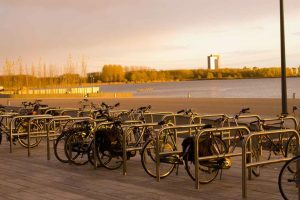 This map and guide is a quick walking tour through Almere Centrum. There are 6 numbered squares and a passage marked in dark red. The yellow lines show major paths to take between squares. They are slightly offset to the street so you can still read the name of the street. Stationsplein is the square just to the south of Almere Centrum Station. Plein (pronounced “pline” in English) is the Dutch word for square. Thus Stationsplein is Stations Square as both trains and buses arrive here. Trains arrive on an elevated platform above street level. Buses arrive under the train station in a Bus Square. One of the really neat features of being a planned city only 40 years old, is that Buses were given their own streets through town that are reserved for only buses and emergency vehicles. No other vehicles may use the Bus Lanes. This means that both busses and emergency vehicles can travel without traffic interference. This makes bus and ambulance rides way better for everyone involved. 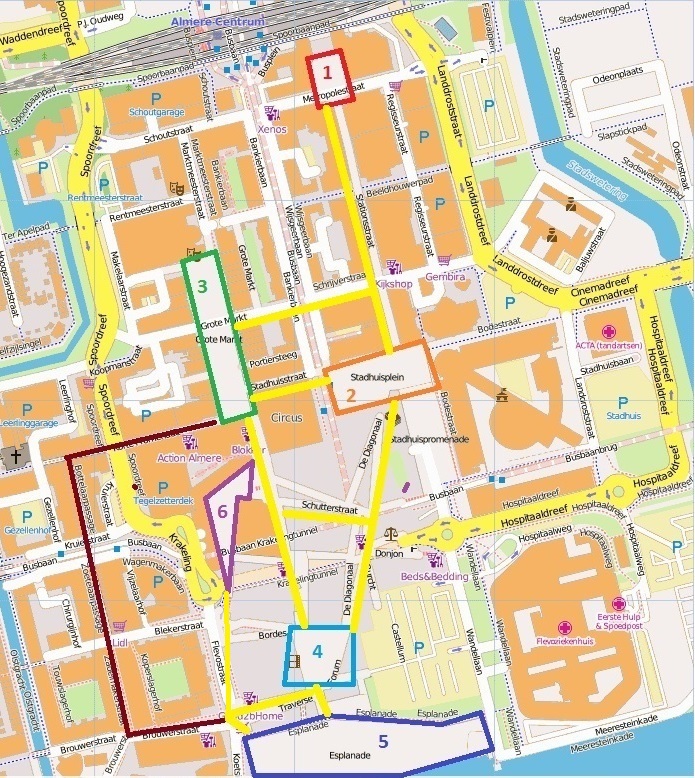 However you should take note of the major Bus Lane that runs between Stadhuisplein and Grote Markt. Bus drivers assume everyone knows the rules and will let a bus pass at full speed at crossings. This bus lane is the only real “road” you need to cross at any point so please be careful. As you exit the train station you will see a large square. There are fountains in the ground in the square along with several restaurants. There is a belgian frites, or french fries, shop on the square if you would like a snack. Just to the left of the station is FEBO, a classic Dutch eatery where you buy pre made food that sit in small mailboxes. In the 1950’s the US had a similar thing called an automat though they are rarely if ever seen in USA any more. Head across the square and along Stationsstraat where shops line both sides. A short 3-5 minute walk will bring you to Stadhuisplein. Stadhuisplein is city house square, or city hall in English. Here you will find the government offices for Almere. Almere Stad Library, de nieuwe Bibliotheek, is the triangular looking building with a glass facade and a long escalator going up. De nieuwe Bibliotheek was voted Netherland library of the year for 2010 as well as racking up a number of architectural awards for its exterior and interior design. If you come from a country where libraries are old neglected buildings with one million books crammed onto 8 shelves, take a quick walk inside de nieuwe Bibliotheek and see what a library can be. Stadhuisplein is a large square and it hosts a market every Wednesday and Saturday. If you happen to be in town on either day, it is a great opportunity to bust out the foodie inside of you and test some of the delicious treats the Dutch serve up. Everything from herring, to stroopwafels, to hot nuts, to healthy alternatives most likely come from a farm within 20 miles of Almere. From Stadhuisplein you can keep walking south along a road called de Diagonal which brings you through city mall and to The Forum. Or you can head west over to Grote Markt. Grote Markt translates into large market, and Grote Markt is the largest square in Almere. It is in Grote Markt that festivals like Octoberfest are held. Many of the larger pubs and taverns ring the Grote Markt. One of the two coffeeshops in Almere is also located in Grote Markt. Grote Markt has several passages leading into and out of it. A path to the east will take you back to Stadhuisplein. A path uphill and southeast will take you towards the Forum and past Belfort. A walking street to the west will take you to The Passages. The Forum is perched on top of the hill. From here you can either walk down to the station to the north or down to the coast of the Weerwater & Esplande to the south. The path west will take you to The Passages. The Forum is another large square. This is where Sinterklaas comes in November to announce his arrival in the Netherlands and mark the beginning of the Christmas season. No one is a bigger rock star or gets a bigger production than Sint, so the second weekend in November is a great time to visit. The Forum is ringed by restaurants and shops, but it also is the home of Utopolis, the locale movie theater. Again if you come from a place with dingy old movie theaters, a walk around Utopolis is worth the time. Along the coast of the Veerwater, Esplande is another large area that is the home to a variety of events during the year. Large events like a carnival or a car show may use the Esplande. 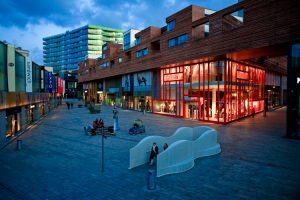 The Esplande is also the home of many of the most iconic building in Almere. Known for its modern architecture, Almere houses some of the finest example of modern architecture in Europe. Kunstlinie, the large building on Esplande houses the KAF Theater Almere. It also is part of the Apollo Hotel complex. The Wave is an amazing building that sits right next to the Urban Entertainment Center. If you stand on the Esplande and look back towards The Forum, you will also see Blok 5, another iconic building. All 4 of those building are listed on the World Architecture Map. The passage marked in deep red will take you west past Urban Entertainment Center and towards The Passages, a series of shops. Or you can head back towards The Forum and head over to Belfort for a meal. 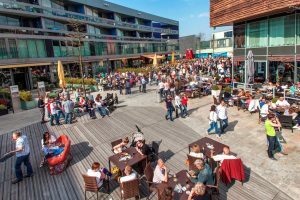 Almere City Mall decided to house many of the traditional sit down restaurants in a giant food garden terrace incorporated in City Mall. On Belfort terrace you will find over a dozen high quality restaurants with menus ranging from BBQ, Japanese, South American, Mediterranean, and almost everywhere else with the exception of Dutch. For whatever reason, and the biggest may be few tourists have discovered Almere yet, you can’t sit down and have a Dutch dinner in Belfort. 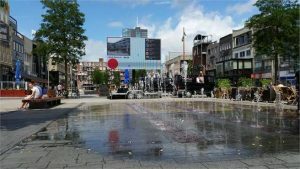 Hopefully this will change as more and more tourists are realizing that Almere is only a 20 minute train ride from Amsterdam and you will be able to sit down to a nice plate of Stamppot soon. 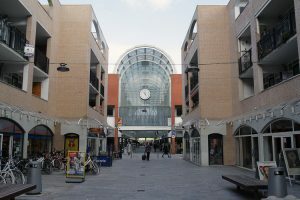 Before the construction of City Mall, The Passages were the major shopping area for Almere Stad. There are two passages, Bottelaar & Zoetelaar. Bottelaar connects Grote Markt and Zoetelaar. Zoetelaar connect Urban Entertainment Center and Bottelaar. The Passages are lined with shops and are sprinkled with ethnic food markets, pubs, and small eateries. Above each passage there are apartments for residents. In fact, throughout Almere Stad and City Mall you will see residences above all the shops, and car parks underground. This three layer city, parking below, shops on street level, residence above shops, is all part of the modern city plan. Car, busses, pedestrians, and bicyclists all have their own unique paths and road networks in Almere allow for quick and safe transport regardless of the method of travel. Almere Poort, Almere Haven, & Almere Buiten are all easily reachable using public transport. 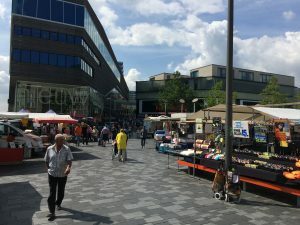 Each area has its own charms and sites to see, but this guide should allow you to easily navigate and tour Almere Stad. Power walking, the tour may take all of 15 minutes. A leisurely stroll to check out some shops and have a bite to eat may take a few hours. If you have an entire day, you may want to interact with nature a bit more. Lepelaarplassen is a world renowned wildlife preserve, and Kemphaan is the home of a wide variety of fun outdoor and animal adventures. Both are a 10-15 ride outside Almere Stad but well worth the time and effort if your schedule allows it.